This meditation allows you to experience the strength and power of this ancient sun symbol in a new way. As you release dense energies and clear the space in and around your body you will also revitalize your energy centers as you renew your connection to the Goddess and to Mother Earth. The focus of this meditation is healing. As you connect with the images of a pilgrimage to a holy well, it will also bring you on a healing journey deep inside your body, encouraging you to become aware of your own power to access the life force and heal yourself on many levels. Focusing on the magic and power of the oak tree, which was well known to the ancient Druids and also to Brigid, the 5th century saint, this meditation is one to work with at those times when you feel a need for support. Relax and restore your strength in the peace of the Oak Grove. The story of how Saint Brigid extended her simple cloak so that it covered enough land to enable her to build her first church leads you into all the magical possibilities of transforming and expanding your own cloak/aura and creating a peaceful sanctuary. The ancient stories and symbols of Brigid have been my inspiration in creating this meditation cd. The four meditations can be used individually or together. 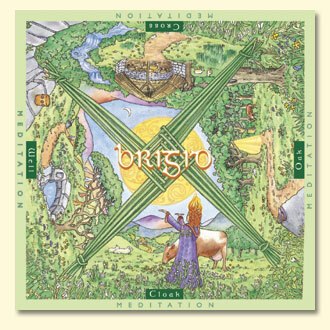 Brigid’s Cloak: Transformation and Expansion.